The Rural Payments Agency has started sending out a BPS update leaflet to everyone who submitted a 2015 application. The leaflet called ‘Basic Payment Scheme 2015: What happens next?’ is being sent to farmers so they know what to expect in the coming months - when and how farmers should expect to hear from the RPA about their claims. The RPA will not call you directly and ask for your bank details. You will be asked to call us back and be required to clear security questions before we talk to you about your personal details. The link on this page headed 'Help remains on hand as late claim window opens for BPS 2015' is obsolete. Thanks for the comment. The guidance on Basic Payment Scheme applications is no longer available as the application window is now closed. Applications are currently being processed. Is there a link to the actual leaflet itself somewhere that I am missing ? Hi, thanks for the comment. 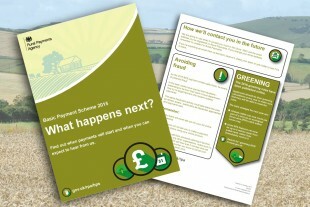 We have added a link to the leaflet in the news story https://www.gov.uk/government/news/rural-payments-agency-provides-applicants-with-bps-update.